Because the general election looks set to produce an impressive win for the Conservatives, its main interest lies not in the result itself but in the result of that result. The House of Commons will look very different on June 9, and the implications of that could turn out to be very big indeed. That’s especially true for the opposition. For Labour, heading for what many of its own people fear will be a very big defeat, it’s all about who comes after Jeremy Corbyn. True, he may not step down immediately. But he is unlikely to stay for long after the party’s first post-election conference in September. There, Corbynistas hope to make a change to party rules that would make it much easier to get a left-wing successor into the contest to replace him. The aim is to require just 5% of MPs and MEPs to nominate candidates for leadership, instead of the current 15%. That would significantly shift the balance of power in these contests from parliament to party members. There is also a possibility that those urging Corbyn to stay on would allow him to step down straight away if they could find a successor capable of getting 15% of MPs and MEPs to nominate them prior to any rule change, thereby triggering yet another summer leadership contest. If Labour is heavily defeated on June 8, the number of MPs needed to reach the 15% threshold would fall. 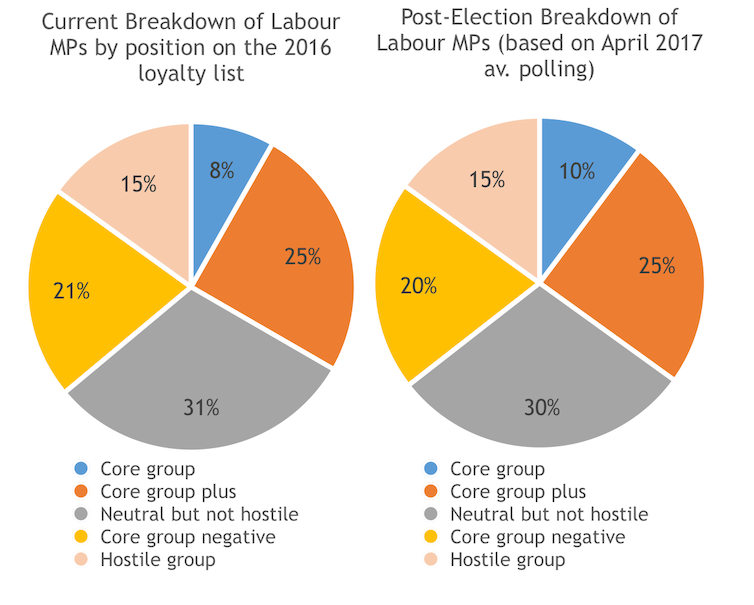 If the number of Labour MPs, 232 at the last election, fell to 150, any candidate would need the support of 26 MPs and MEPs to stand (because there are, until 2019, 20 Labour MEPs). 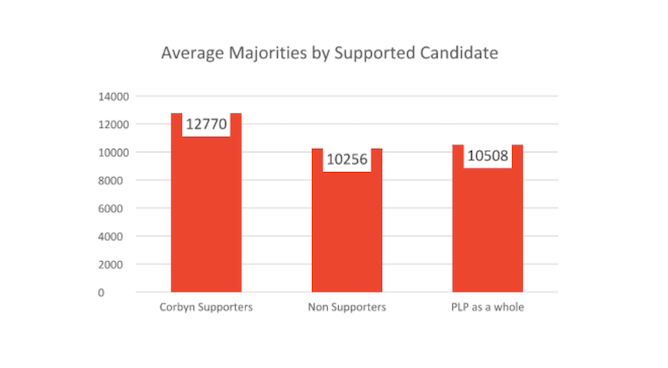 In other words, precisely the number who supported Corbyn in his second leadership campaign. 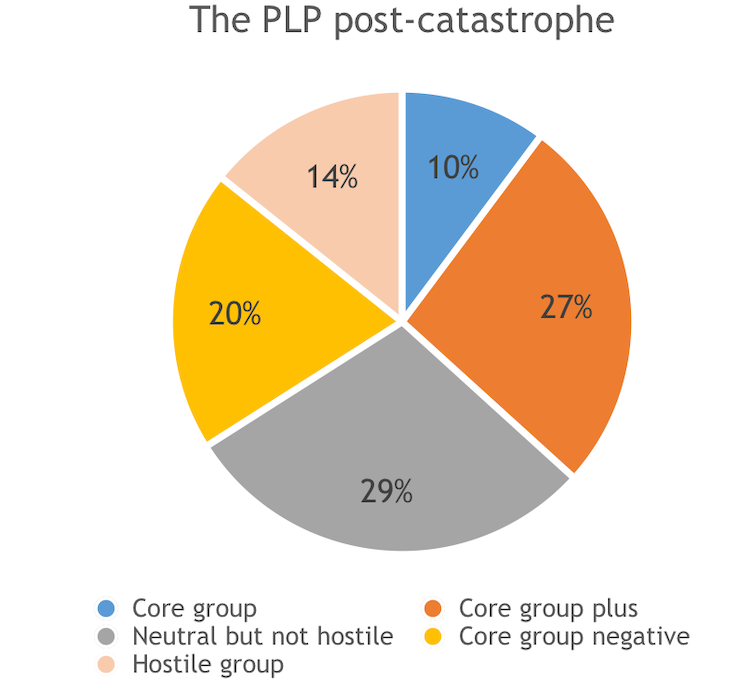 But what we’re most interested in is John’s follow-up point, namely that a truly woeful performance by Labour on June 8 will paradoxically help the PLP’s left-wingers. It’s an argument predicated on the assumption that, as he puts it, “naturally, Corbynites tend to be in safe Labour seats, so a catastrophic defeat for the party won’t affect most of them”. This entry was posted in Uncategorized and tagged Jeremy Corbyn, Labour Party, MPs, PLP. Bookmark the permalink.